There are many different worlds of nature in the Western Desert. One part that is really spectacular is the Black Desert, a dark rocky area which owes its appearance to ancient volcanic action and the presence of the abundant iron ore. It is located in the area around Bahariya oasis. The black topped golden mountains are the glory of the Black Desert and the Bahariya Oasis. The wonderful huge hills and mountains seem to be just out from everywhere. The primarily conical mounds are formed by Cenomanian sandstone and chalky clays. Most are capped with iron quantizes and dolerite rocks. In addition, there are reddish hills of ferruginous sandstone and ocherous clay laced with limestone. 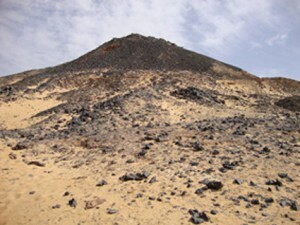 The sand around the mounds is covered with a crusty and thick layer of old dolerite, black basalt and volcanic rocks, which gave the desert its name. The soot-coated stones, ranging from pebbles to boulders, lie out across the yellow and orange sand. So, the Black Desert is not quite as black as you may expect. Among the dominant mountains are Gebel Hafuf, Gebel Ghaba (Mountain of the Forest), Gebel Ghurabi (Mountain of the Crow), Gebel Dist (Pyramid Mountain), Gebel Maghrafa (Mountain of the Ladle), Gebel Mandisha, Gebel Mayisra, Gebel Hammad, Gebel Tibniya, Gebel Hadoam, Gebel Miteili Radwan and Gebel Shahut. If you visit the Black Desert, don’t miss Gebel Ingliz or Williams Mountain, named after the British captain who once was stationed here during World War 1. The British monitored the movements of Sanusi tribes from Libya from this fortress. The ruins of the army outlook post are on the top. One of the beautiful attractions of the Black Desert is Pyramid Mountain, a relief form that shoot up from the ground much like pyramids out of the desert. The mountain has symmetrical sides and a pointed peak. This natural pyramid is just a few kilometres away from Bahariya Oasis. Locals call it Magic Mountain because of the way the light plays on the texture and material of the mountain during the different hours of the day. The golden colour of this rock is very attractive, especially in the later afternoon sun. If you take the challenge to climb this mountain, which takes about one hour, the top will surprise you with an impressive view over the oasis, the desert and thousands of palm trees. At the base of Gebel Maghrafa and Gebel Dist we find the bone beds of some famous dinosaurs. Paralittitan stromeri, Abelisaurian or Dromaeosaurid therapod and Titanosauriform saurapod. Climbing one of the many charcoal peaks will give you a magnificent view from the surroundings. What once used to be a huge area covered with water shows now its beauty in black, yellow and reddish colours. The landscape looks desolate, since it is uninhabited, but has a serene atmosphere. It gives you a sense that you are on another planet. An off-road jeep safari can take you past rolling dunes and through canyon-like rock formations. And if you by the way have the chance to camp in the Black Desert when the night comes, then be prepared. The sky picture with millions of bright stars will take your breath away. No where is the Milky Way that bright as here. Just look for a shooting star and make your wish.